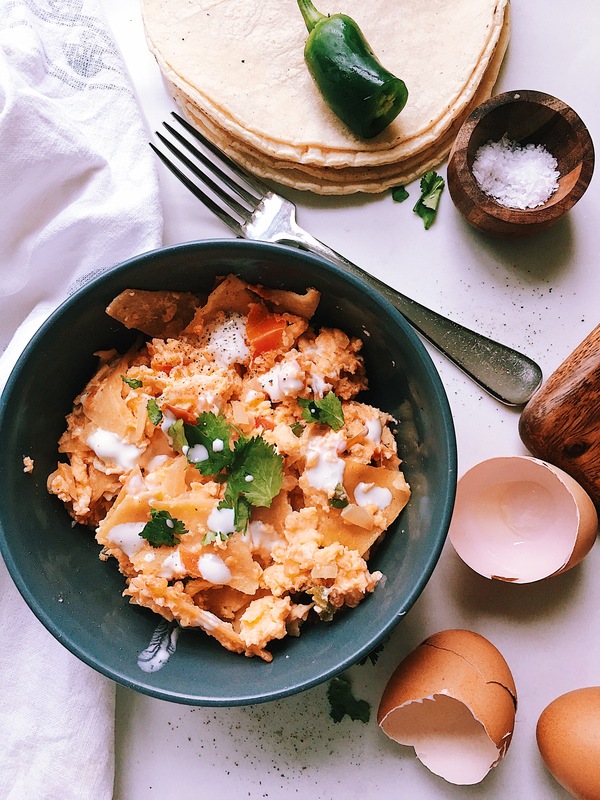 When I was living in Mexico my mum used to make us this for breakfast, it is a great way to use your leftover tortillas, Migas Mexicanas is like the Mexican version of the Spanish, but instead of using bread like Spanish people do, we use stale tortillas. It is a quick and delicious breakfast. Heat the oil in a large frying pan. Once the oil is hot add the tortillas. Fry the tortilla chips until golden brown then remove them from the pan and leave them to drain on a kitchen paper towel, we do not want a lot of oil. The other and more healthy option is to roast the tortilla pieces in the oven, 180 degrees for 15 min or until golden brown. Then in the same frying pan add all the veggies, except the coriander, and cook them for 10 min, add a 3 tbsp of water if necessary, then add salt and a pinch of ground black pepper. Once the veggies are cooked. Add the tortilla pieces already fried and soon after the beaten eggs. Stir continuously until the eggs are cooked and turn off the heat. Serve the migas on a plate and scatter some cheese, sour cream and slices of avocado or just enjoy them with some fresh coriander like I do. And to make them even extra special, add some spicy salsa. Enjoy!